The design of a roof drainage system should be realized by an authorized and experienced designer, taking into account the requirements of EN 12056-3 and strictly following all national and local standards in building planning. The product is intended for rainwater harvesting from roofs of residential, administrative and industrial buildings. In areas susceptible to formation of deep snow and/ or ice cover, we recommend the installation of snow-retention elements, on roofs, as to to prevent possible ice/snow falling that may inflict damage on people and/or property. L - is the length of the roof. 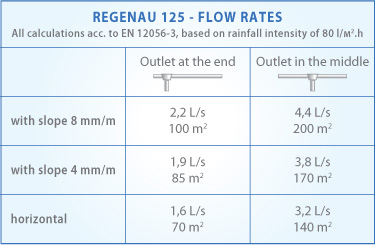 REGENAU gutters are fixed to the front board by using plastic gutter brackets. When installing on buildings without front boards, gutter brackets should be secured on any of the four metal bracket types for installation: above or on sides of roof ribs, on bitumen roofing or tiles. 1.Fix the running outlet, considering the location of the drain pipe and gutter slope. Secure a gutter bracket on each side of the running outlet on 10 cm from both edges. Using a string line, determine the required slope of 0,3% and secure gutter brackets starting with the utmost. They should be not more than 50 cm apart. We recommend to install a gutter bracket on both sides of each gutter fitting at a maximum distance of 10 cm. Gutter brackets should be fastened using screws 5х30 mm and a power screwdriver. 2. Measure and cut the gutter lengths to required size, considering the insertion mark on each fitting, marked with A. To install the gutter, position its rare edge, under the gutter brackets’ or fittings’ clips, as shown on diagram B. Ease the front edge downwards, until it snaps to position C, under each gutter bracket or fitting. All gutter fittings, excluding the end cap, are equipped with inbuilt seals to ensure reliable, leakage-free joints, hence gluing of joints with seals is not required. In special cases it may be necessary to lute the seals with a fine layer of lubricant that will facilitate the movement of the gutter. To fix gutter end caps use PVC glue. 3. 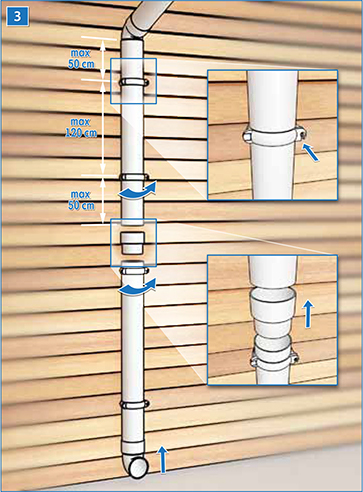 Install the pipe brackets at a maximum distance of 120 cm from each other and at 50 cm from each pipe end. Use appropriate screws depending on the thickness of the stucco and the insulation of the building. Place the pipe in the bracket, close the front part and fasten it with a screw. To join pipes with the respective fittings use PVC glue. To allow for thermal expansion, leave a 7-10 mm clearance between the end of each pipe and connector bottom and glue only the bottom (narrow) of the connector and upper edge of the pipe. A pipe bracket must be positioned just under each pipe fitting - D.
All gutters and pipes must be stored above ground level on smooth surfaces without sharp edges. The products should be arranged freely without twisting or bending. DO NOT arrange them in heights greater than 6 package layers. All fittings and connecting parts should be stored indoors in their original packages, to protect product damage or pollution. Ventilation for all products should be provided during storage period; they must not be wrapped in or covered with transparent or opaque foils. To prevent scratching of gutters and pipes do not slip on to one another.